Last week we started to review tachidori for testing coming up in our Fridays class. Tachidori is Aikido open hand movements against an opponent with a sword (bokken – wooden sword, real sword, etc). I really enjoy these movements as you really feel the need to move out of the way and off the line. When I was visiting another school for training a while back I was talking to on of their students about the upcoming testing. He was very concerned with the tachidori (and jo dori – defense against a jo) section of the test. I thought about this idea more and how can students better understand tachidori better for their own practice. As usual I came to my normal thought of it all starts with basics (kihon). I will try to get some of the initial ideas I came up with and started practice with the other night. 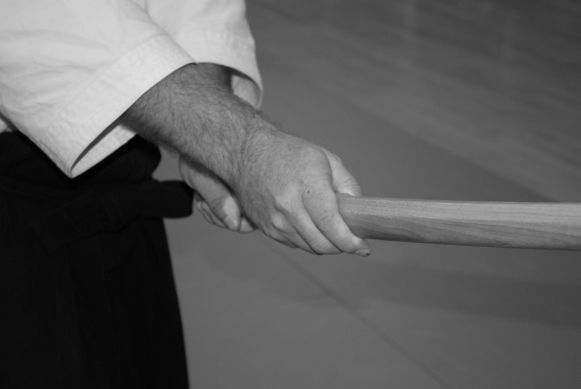 The attacker first must be able to do a clean commited staight strike down with their bokken. There are other strikes for tachidori practice, but students must master this one first. The uke can do a sliding strike, or what we practiced was to employ a steping strike with our back (left) foot. Now that we are getting a good committed attack from our uke we can begin to learn to enter or irimi. In Japanese irimi means (iri – enter) and mi (body). We are entering in but off the initial attack line, and attempting to stay close to our partner. Before we go into the specifics of the entering techniques I wanted to talk a little bit about mind set and foot movements. The first is how we have our mind set. In Aikido and especially we need to have complete focus (zanshin) of our opponents and our surroundings. However, while keeping this awareness we must try to stay as relaxed as possible. This mix of awareness and relaxation lets us respond quickly to what comes at us. The second important concept to keep in mind while we move is our foot work. I think a lot of Aikidoists only think about their techniques and not a lot on their footwork. This is not everyone, and there are a lot of schools and styles that have exercises that focus on the important aspect of our footwork. One thing a lot of newer students do is walk or move heel to toe. In Aikido we should always try to move on the balls of our feet and depending on the movement think about where the balance of our feet are. We could talk about this for a while, but I just wanted to touch upon this. Sliding forward with our right foot to your right (uke’s left) and switching our hips. When we switch our hips we turn our body towards the uke and end up facing 180 degrees behind us with our left foot forward. Sliding forward with our right foot to your right (uke’s left), and when we cannot slide forward anymore we step back in a sweeping motion with our left foot from behind us all the way around to 180 degrees and our right foot is still in front. In Aikido we call this soto (outside) tenkan. This movement is a basis of a lot of our movements and techniques. With our right foot forward we will step forward with our left foot to our right (our partner’s left) and when we cannot move forward with that foot any more we will turn towards the outside and step backwards with our right foot. Now are inside is towards our partner. 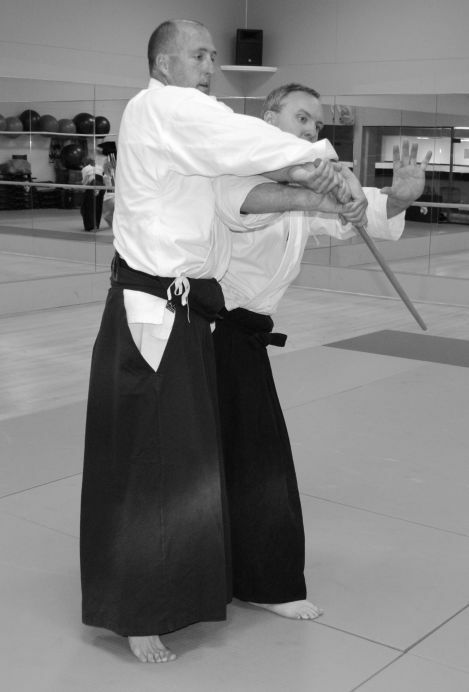 This in Aikido is called an uchi (inside) tenkan. This is a little more difficult and your timing really needs to be on for this. This is a pure entering technique, and fun to practice. A lot of hip throws and corner drop type throws are from this position and entry. Now that we have these three we can mix it up by starting with the opposite forward (left this time), and try to take one step depending on the technique to our right. For example, the #1 above starting with our left foot we would take a large step to the right with our right foot and switch our hips ending up as we did on #1 with our left foot forward facing 180 degrees. Now you have six entering techniques just to the right, and six to the left (12 in all). This is a good start to really work on and get comfortable with. It is strange new students are not comfortable with someone swinging a sword at their head. Boggles the mind :). The last concept I really try to beat into my students heads is that with tachidori there really is only two basic sides. If we move to the right (our partner’s left) this is the inside or what we call the futokoro side. If we move to our right this is the outside or the tamoto (sleeve) side. This is true because with basic Japanese swordsmanship we always have our right hand on top and our left hand on the bottom of the sword (see picture). So if you move to the outside (tamoto side) you have different options with the hands and the arms that you do on the other side. Later I may go into various basic techniques that you can do from both sides, but I just wanted to point out that this is where we can start when trying to breakdown basic tachidori. After reading (and writing) those descriptions I know why it is much easy to show and demonstrate techniques than to read them. However, the only sure fire way is to practice, practice, practice. How does your school begin to teach tachidori?